It's the end of my work week and it's been a week since our last grocery trip. 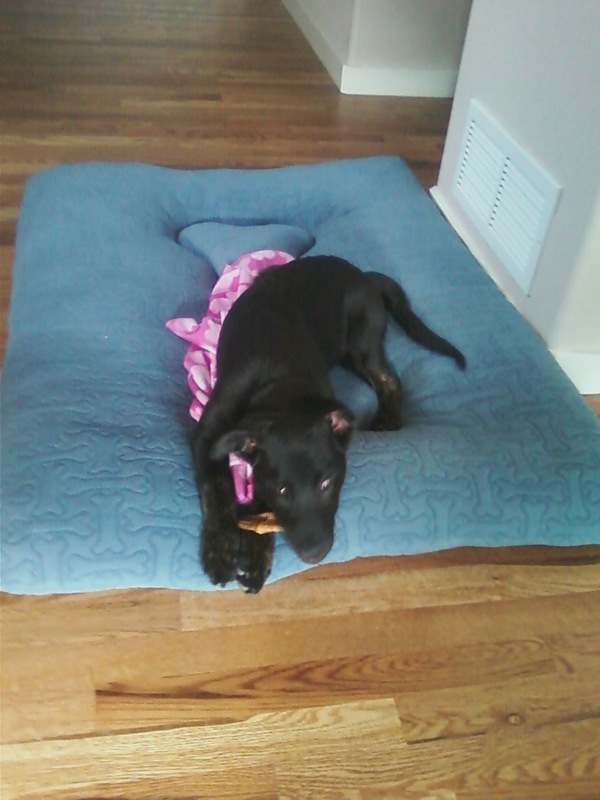 This means that I'm tired and there's not a lot of food in the house. So, when looking through the cabinets this morning I decided to make some fried rice and clean out some of the older veggies and things from our fridge and freezer. 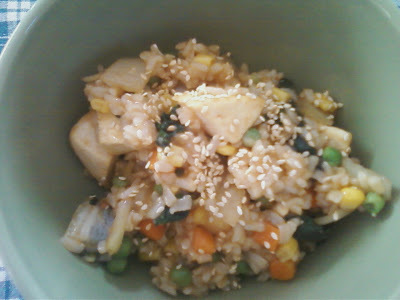 I made the rice this morning (it's best if it's cold when you add it to the stir fry- this little gem of cooking knowledge is thanks to my friend Emily) and then popped it in the fridge for the day. All I had to do when I got home was press and fry the tofu and cut the veggies for the stir fry. So easy. Feel free to play around with the ingredients, especially the sauces. I used leftover homemade sweet and sour sauce from some skewers we did on the grill this weekend. I bet a simple soy sauce would be great too. I'll just put down the ingredients for what we had but again, feel free to play around with the recipe. 1. 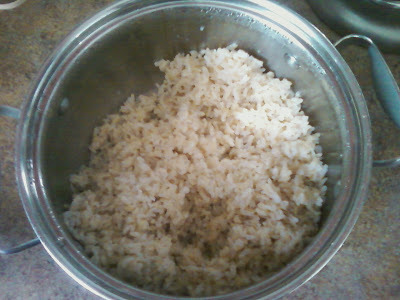 Make your rice ahead of time and stick it in the freezer for a few hours or overnight. 2. 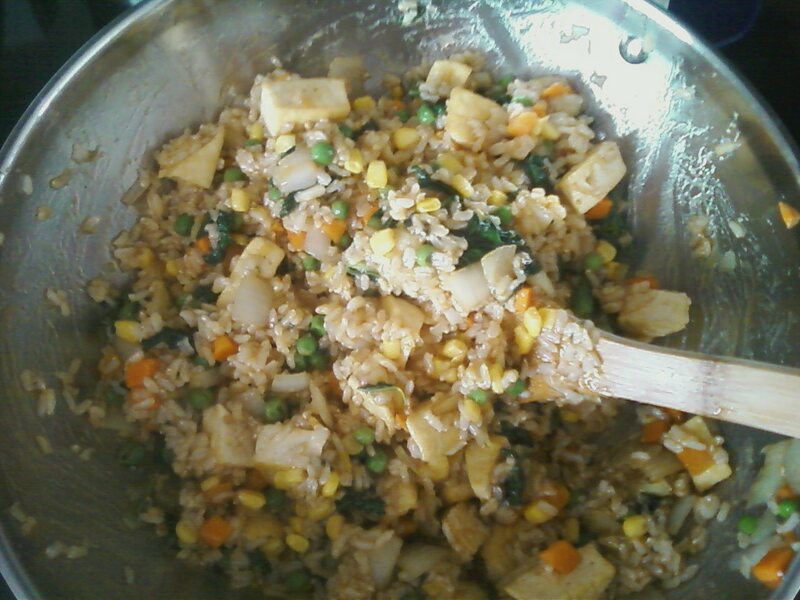 When ready to make the fried rice, drain then press the tofu for about 10 minutes. 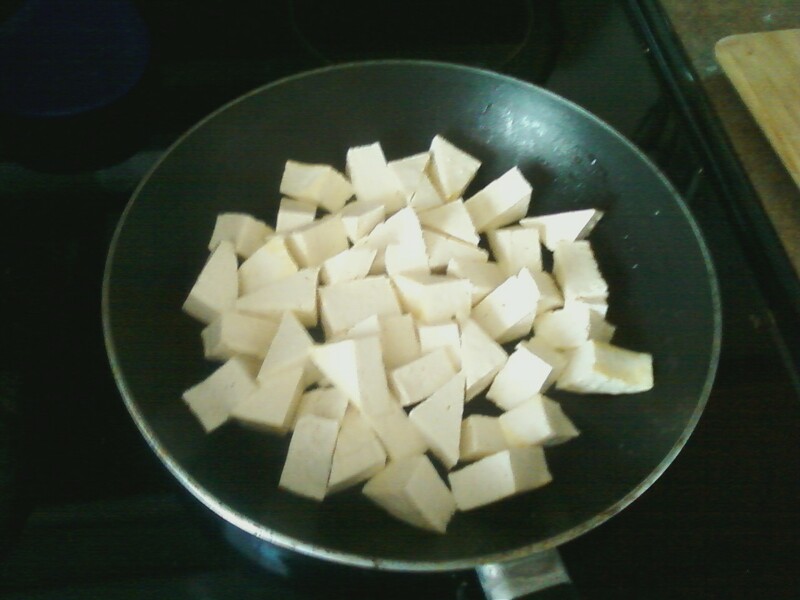 Cut into desired shapes and fry in a bit of sesame oil until browned. Set aside. 3. Chop up the other veggies and heat up a splash of sesame oil in a wok (or a big pan, but really, a wok is fantastic). 3. When the oil is heated, sauté the onions until translucent or even starting to brown. 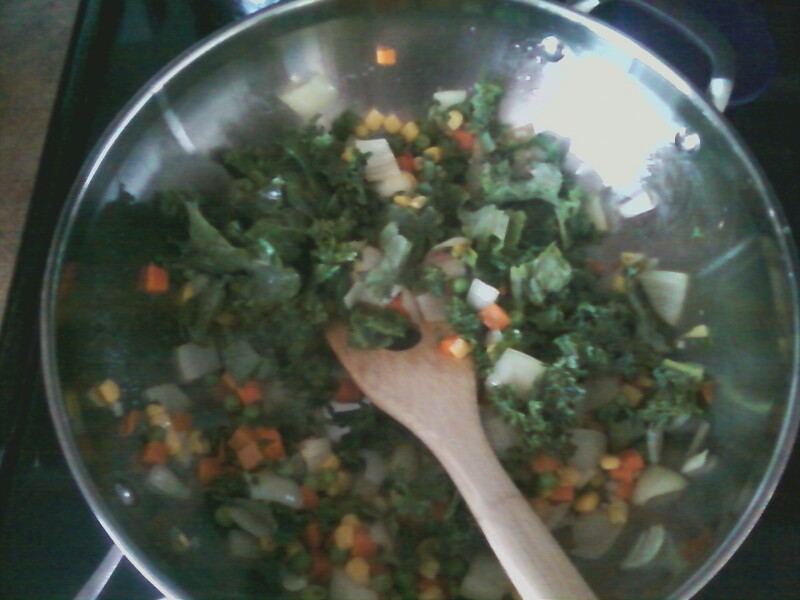 Add the kale and garlic and heat until the kale is wilty. 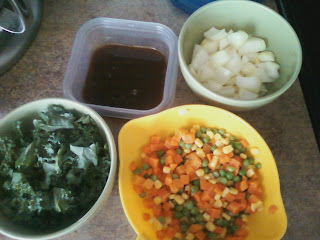 Add the frozen mixed veggies and a splash of soy sauce and sauté mixture until it's heated through and starting to cook. The kale should be all wilted by now. 4. Add the rice and fry for a few minutes, stirring and flipping it over as it cooks. Now add the sauce and stir until it's mixed in- add the tofu last and gently stir and cook for about another minute so it can absorb some sauce. 5. Serve with some toasted sesame seeds or soy sauce if desired. This rice would also be great with some pineapple and cashews, maybe some beans instead of tofu, or with different spices and even non-asian influenced sauces. Go nuts!